This COG Members Online System (COGMOS) is your gateway to many great member features! You can enjoy some of what COG has to offer without joining and paying our modest membership fee. However, by becoming a member the full scope of features below will open up. You can pay and renew your dues online, communicate with members and post your pictures and stories for all to see and read. We invite you to join this exciting new world, and find out why the best part of owning the finest sport touring machine is COG, and its members. Receive discounts and notifications to club events. Events like our annual National Rally hosted at a new location each year and attended by over four hundred members the last few years. Local rides, Ride to Eats, Tech sessions and more are happening all across COGdom all year round. Don't miss out! Be sure to look over the event calendar. Get discounts on most fee based Club events, COG Merchandise, and occasional specials from COG’s Industry Members and other vendors such as a RoadRUNNER magazine subscription discount. ROK is a motorcycle community for riders and enthusiasts who enjoy camaraderie and the sport of motorcycling. Sport Bikes, Cruisers, Dual-Purpose, Supersport Touring, Touring and Off-Road. COG used to be an affiliate to Riders of Kawasaki (ROK) before AMA began managing their membership, which includes 24/7 roadside assistance in the US and Canada and other perks. Check the ROK web pages for details. The members forum, links and Library give you access to live and archived help and knowledge that has been collected in the 25 plus years of the bikes existence. It is like having twenty other mechanics help you with your problems. Tech articles on the ZG1400 C14 appear almost every issue of The Concourier magazine. Online versions of the club's collection of technical article publications "Best of Chalkdust" for the Concours ZG1000 (C10), and "Chalkdust 2," for the Concours ZG1400 (C14) are available in the member exclusive library. Subscription to COG’s premier quarterly magazine that contains many pages of articles and reports about past and upcoming rides, news from the COG regions, safety info, technical tips, "how to's", member interest stories, and much more shipped right to your door. Membership also include access to a several year online Concourier archive. To allow you to sample the delights of the Concourier we have made two sample issues available for viewing: The complete Fall 2007 Issue and a teaser of the Spring 2013 issue. Access to COG’s online membership directory, plus optional hard-copy delivery. Meet up with fellow COG’ers for local riding buddies, assistance while on the road including those offering bedroll or camping space. Each COG Area publishes a newsletter which keeps members up-to-date on activities and events in your part of the country. Click here to view an example of one of our Area Newsletters. COG has built up and extensive library over the last 20 years. 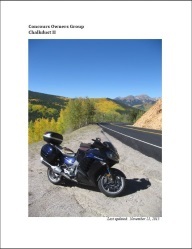 COG membership provides immediate access to this wealth of information on the Kawasaki Concours ZG1000 and C14 including: past issues of Concourier, Area News letters, GPS files, technical bulletins, and media reviews of the Concours since it’s launch in 1986. There has been a COG online community presence in one form or another since 1995... and the original Micapeak email listserv is still kicking around. Presently the most popular community is our own web forum, and a subscription is included with all paid memberships. There is also Facebook group, and Google+ group. These online communities can be the places where you can find help with everyday issues, discuss the fine new farkle you just installed, brag about your last great trip, or simply chat about life, the universe and everything else! You can link up to these places and more on the COG's Online Evolution page. To sell your Connie or those old clapped out spares at the back of the garage COG members can post their ads free of charge.